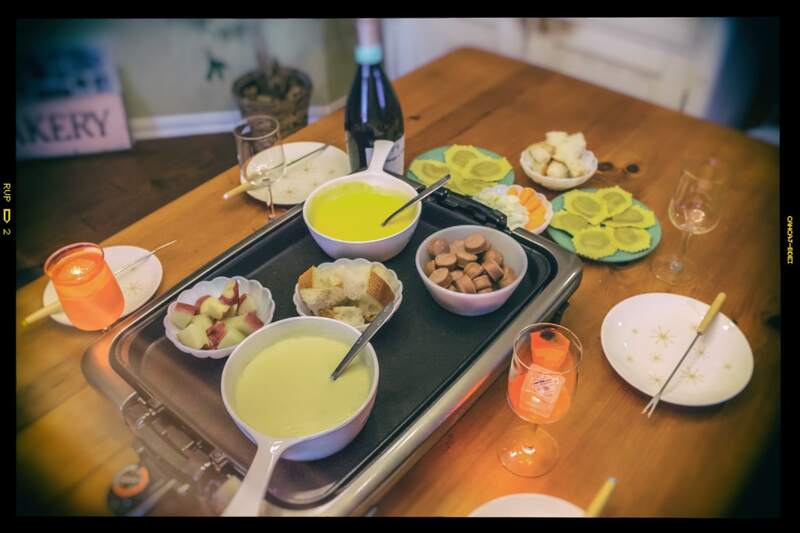 One of our family traditions is that we have a lovely fondue dinner to celebrate Valentine’s Day. This year, the dinner was on the 15th because we attended a Chinese New Year’s celebration on the 14th. But, the fondue was excellent as always (even tastier this year, in my opinion) and the four of us really enjoyed ourselves. I’m not sure how or when the fondue tradition started, but it is something we look forward to every year. It’s so yummy! This year, the kids had LED ice cubes in their drinks, while Mariko and I enjoyed a bottle of Prosecco. The cheese fondue was accompanied by French bread, bratwurst, cauliflower, potato, and ravioli. The chocolate fondue (not pictured) was accompanied by banana, strawberries, and marshmallows. Just FYI, Mariko and I had a cheese fondue that had white wine added, and our chocolate fondue had some chocolate liqueur added. Mmmm. So good!